Bernie Sanders reportedly plans to lay off half his campaign staff. 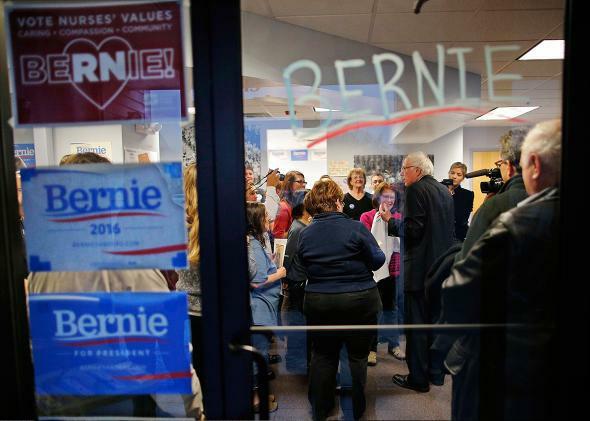 Democratic presidential candidate Bernie Sanders talks to supporters as they open a new regional campaign field office in Salem, New Hampshire, on Dec. 14. Bernie Sanders has remained adamant that he is still a competitor for the Democratic nomination in spite of an increasingly abstract path to the nomination. That march to wherever it might end up got even harder Tuesday night as, before all the votes were counted, the New York Times reported the Vermont senator plans to lay off half of his campaign staff on Wednesday. Many of those being laid off are advance staff members who often help with campaign logistics, as well as field staff members who have been working to garner votes for the senator, according to both a campaign official and a former campaign staff member, both of whom spoke on condition of anonymity. Some campaign workers may move into jobs at Mr. Sanders’s Senate office, but others will be terminated, they said. Those reductions in field and advance workers would make sense since after Tuesday night, there is only one primary left in Washington, D.C., on June 14, and those reductions conceivably wouldn’t preclude Sanders from continuing on to the convention where, at this point, it seems all but assured Hillary Clinton will be the nominee.